The CD203c molecule is a type II transmembrane protein that belongs to the ectonucleotide pyrophosphatase / phosphosdiesterase 3 (E-NPP3) family of enzymes involved in hydrolysis of oligonucleotides, nucleoside phosphates, and NAD. Basophils and mast cells are hematopoietic effector cells involved in allergic and inflammatory reactions. Both cell types highly express the high affinity IgE receptor. The CD203c is expressed on human peripheral blood basophils, but not on other blood cells. It is also expressed by mature mast cells, and by CD34+ bone marrow progenitors of basophils and mast cells. 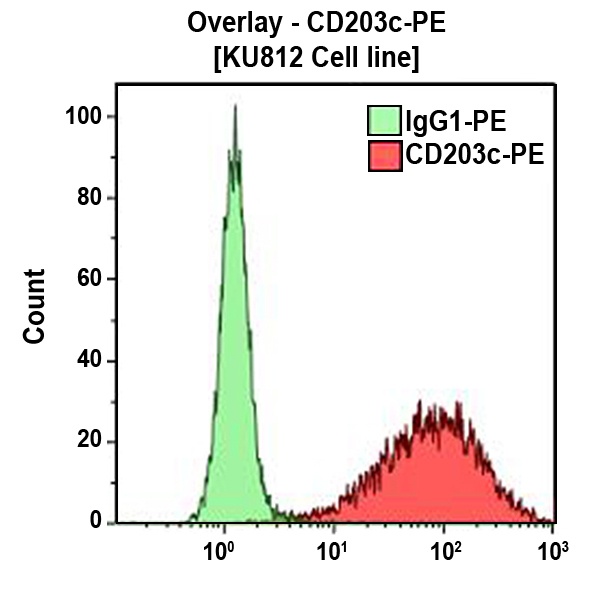 Moreover, the CD203c antigen is up-regulated after activation of basophils by anti-IgE antibodies and allergens. Clone Description The 97A6 antibody immunoprecipitates two proteins of 270 and 150 kDa at reducing conditions, and one protein of 270 kDa at nonreducing conditions, suggesting that the 97A6 antigen is a disulfide-linked dimer of two proteins of about 150 kDa each.